Tobins' Tastes: A Simple Christmas eBook Review & Giveaway! If you have been reading Couponing & Cooking for any length of time you know that I love following Crystal Paine from Money Saving Mom. Crystal is always offering amazing advice on how to simplify your life and make the most of your actions so you can enjoy things more. When I was given the chance to review another one of her ebooks, I jumped at the chance. 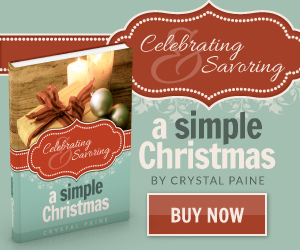 Even though I read Money Saving Mom regularly, I always feel like I can gain so much from Crystal's ebooks and Celebrating & Savoring a Simple Christmas was no exception. As a recently married (if you count almost three years as recently...) couple, Justin and I are still forming our own Christmas traditions as a family so I always love hearing about how others celebrate the season. What is great about A Simple Christmas is that not only does Crystal give us a glimpse into how she and her family celebrate the holidays together but she also gives tons of practical advice on how to make the most of your Christmas season. The best part? For the next three days you can grab this inspiring ebook for only .99 cents! And even better? I am hosting a quick giveaway to win your very own copy for FREE! See the Rafflecopter widget below to enter! The giveaway ends at midnight on Wedbesday so be sure and enter before then! Disclosure: I was provided a copy of this eBook for the purpose of review. No monies were exchanged. This post also contains affiliate links. Breakfast on Christmas morning: cinnamon rolls, orange rolls, deviled eggs and navel oranges. And we always eat breakfast before opening presents! We love driving around to look at Christmas lights on Christmas Eve. Putting up all the decorations! Sharing all of the traditions that my young adult kids and our family have done over the years. It is a great time of sharing, caring, and eating! LOL Thanks for the giveaway! Listening to the children explain to their younger siblings why we celebrate Christmas . . . I love listening to my dad read "The Best Christmas Pageant Ever" to all of us. We're still a young family and figuring it out but so far we've always done calendars as a gift. For some reason I really like that. Since we go to our parents' on Christmas Day, our tradition is that we go to Christmas Eve service at church and then come home and open presents from each other! Favorite Christmas tradition is making a birthday cake for Jesus! Our favorite tradition is baking and decorating sugar cookies. Christmas Eve tradition. We have dinner, go to Christmas Eve service, drive around and look at Christmas light, and go home and watch a Christmas-themed movie! On Christmas Eve we have dinner at my parents house, open one present ( always pajamas LOL) and then read The Night Before Christmas. I am just starting my family, so we don't have any favorites yet, but my favorite as a child was our birthday party for Jesus. Our favorite family tradition is to make monkey bread the night before and have it for breakfast with hot chocolate, since the kids wake us up at the crack of dawn to see what Santa brought! I always get the kids a pair of pajamas to open on Christmas Eve. That way they are wearing nice, new pj's instead of worn out ones in Christmas morning pictures. If I'm really on the ball I get matching ones! Putting on all our special ornaments on the tree! A favorite tradition is buying a nutcracker! Our favorite family tradition is the big Christmas dinner with the family. We always go to Christmas Eve services at our church and have a breakfast casserole on Christmas morning. My favorite Christmas tradition is to turn off all the lights but the Christmas tree lights and read. We do it as a family and enjoy the ambiance.